Ramadan Kareem everybody! Yaay! It’s that time of the year again….Its finally here…..I’ve been waiting for it since the beginning of the year. 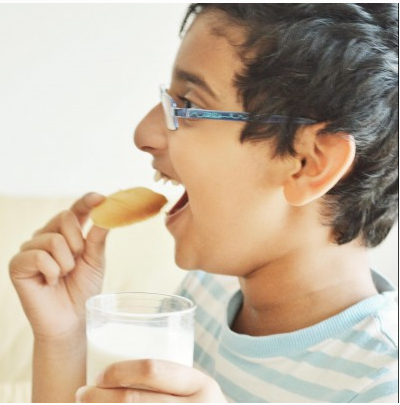 For me and my family, desserts are a must on the iftar menu. And if it is Arabic sweets, we all will be super excited to break our fast, everybody’s eyes will be on that one item, hehe! Yesterday for the first iftar, i made mafroukeh. It was an instant hit among all. I have been wanting to make this sweet for long. 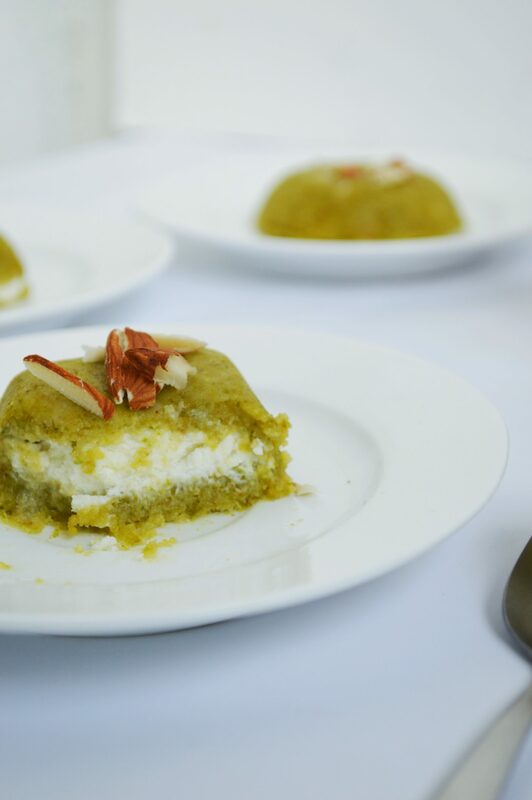 Mafroukeh is a Lebanese dessert made of semolina, pistachios, sugar and butter infused with sugar syrup, orange blossom water and rose water. 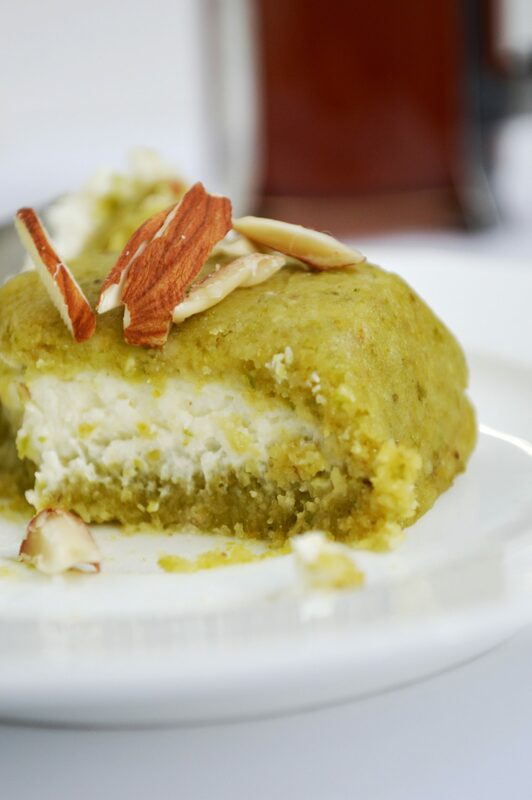 It is filled with a cream called ashta (you can replace it with ricotta cheese or mascorpone or a mix of both). I then drizzled sugar syrup over these mini mafroukeh just before serving. It was so so good. I think you all should try making this. The photos are a bit sloppy this time. Didn’t have much time to do styling and all. But, i swear it tastes ah-mazing! 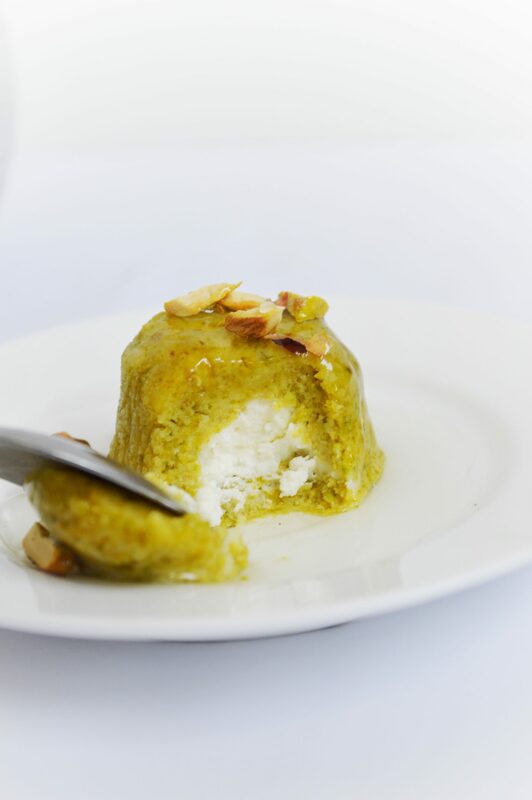 Recipe courtesy: Joumana of Taste of beirut. ✔️ You can make this in whatever mould you want. It would look really nice if made in tartelet mould. ✔️ When shaping the tartlets you can dip your fingers in a mixture of rose water and orange blossom water so that the mixture wont stick to your hand. ✔️ The left over semolina dough can be stored in the fridge for several weeks or in the freezer for several months. ✔️ the semolina i had was not very fine, so i grinded mine in a grinder to a powder consistency. Soak the pistachios in warm water for several hours and the peel off the skins. Set aside to dry the pistachios on a paper towel for half an hour or more. 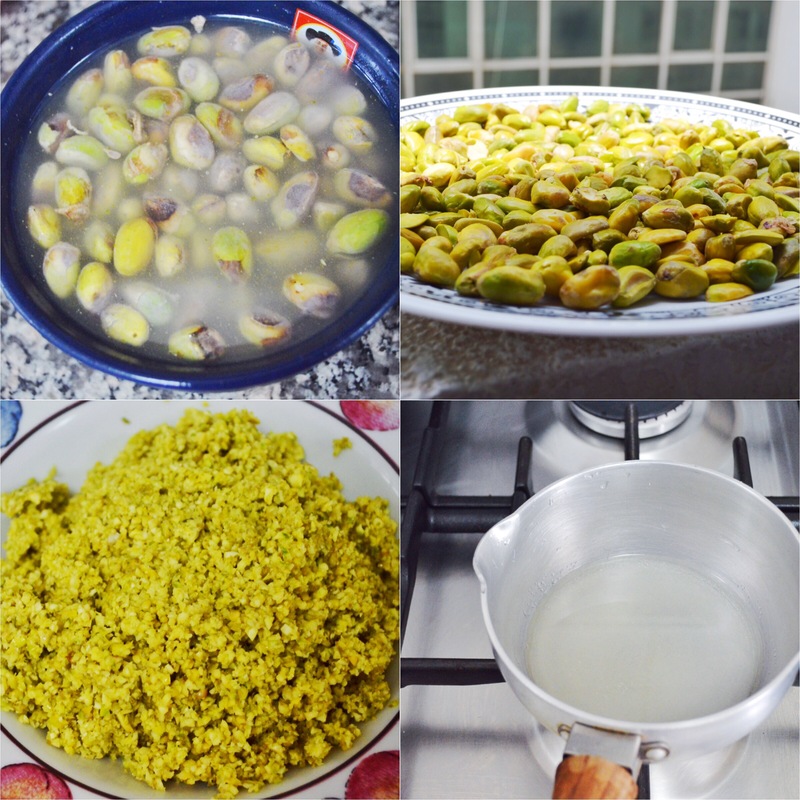 Process the pistachios with half a cup of sugar till chopped very fine. Place the remaining sugar, lemon juice and water in a saucepan and heat, stirring till dissolved. Simmer on low for 5 minutes. 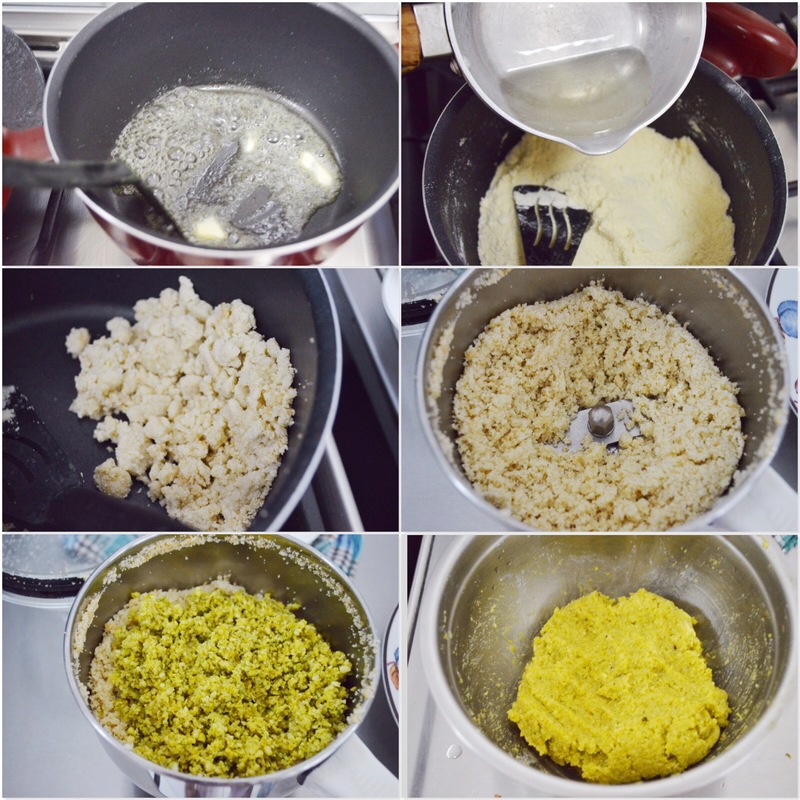 Heat butter in a pan and then add semolina and roast the semolina on low heat for 10 minutes. Pour in the sugar syrup and stir rapidly. Add half of this mixture to the bowl of a grinder and pulse it twice or thrice till it is all separated. Add in the pistachios and again pulse it twice or thrice till it is all combined and you can form a moist dough out of it. Sprinkle orange blossom water and rose water on top of the dough and combine. Cover and transfer to fridge for 2-3 hours. You can use the remaining semolina dough to make some other dessert or this one itself. Line whatever mould you are using with a plastic wrap. 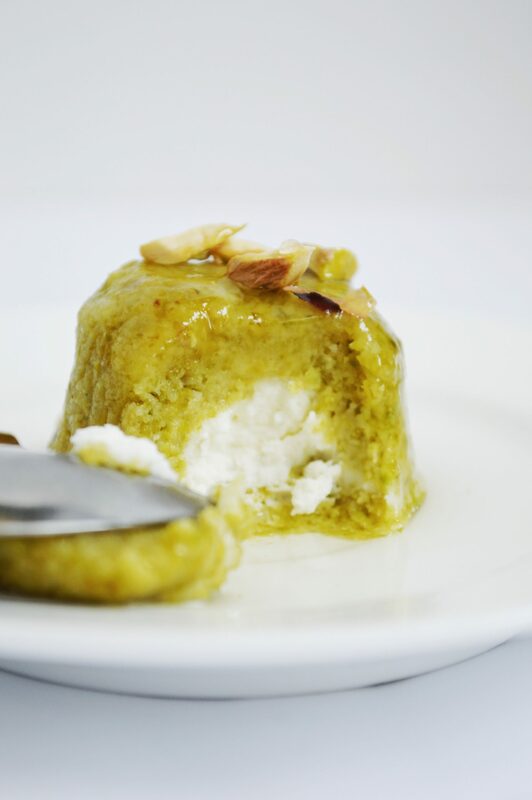 Scoop out a small ball of pistachio mafroukeh and tap gently to line the mould with it. Fill it with some mascorpone. Cover this with a smaller ball of mafroukeh. 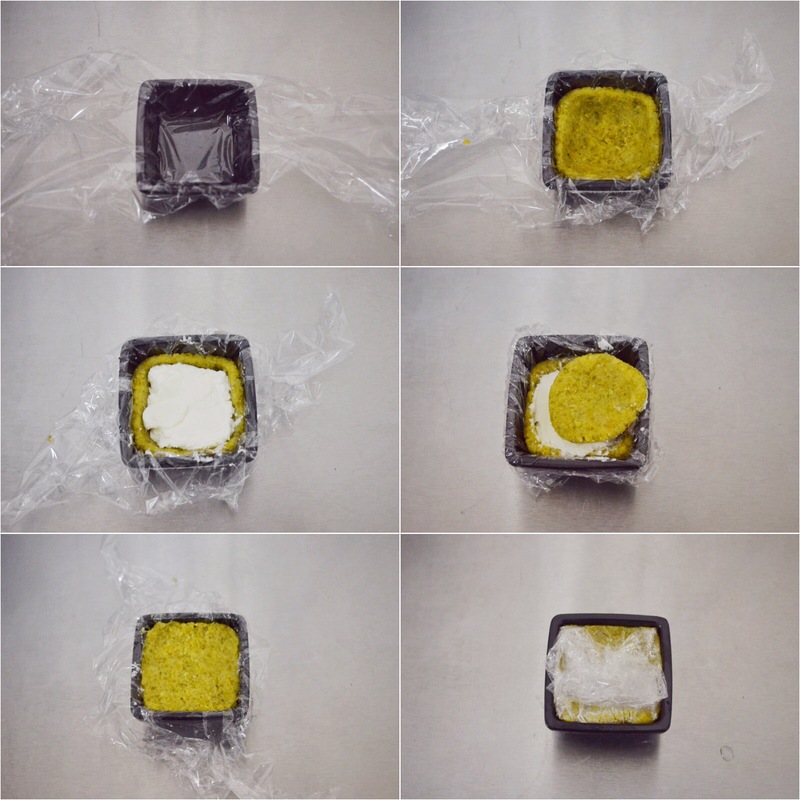 Fold the ends of the plastic wrap over the sweet to cover it and refrigerate it till it is time to serve. Combine the sugar, water and lemon juice in a sauce pan and heat it. Stir until dissolved. Simmer on low for 5 minutes till thick. Turn off the heat and pour in orange blossom water. 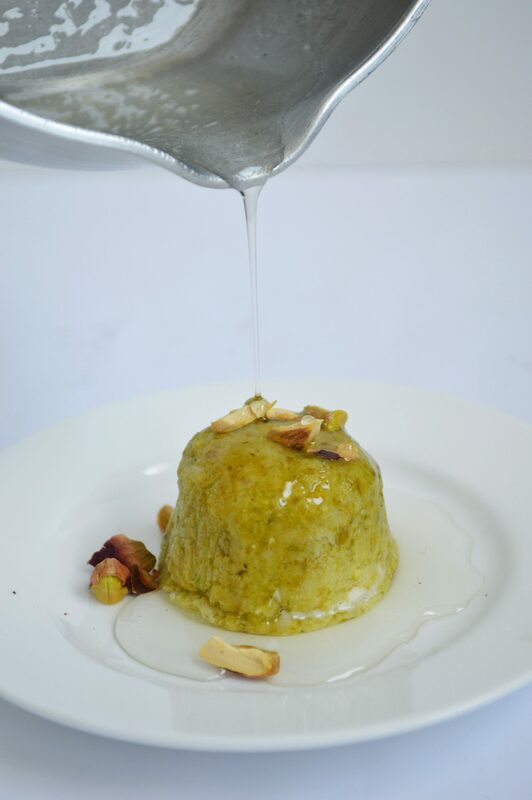 A Lebanese dessert made of semolina, pistachios, sugar and butter infused with sugar syrup, orange blossom water and rose water. 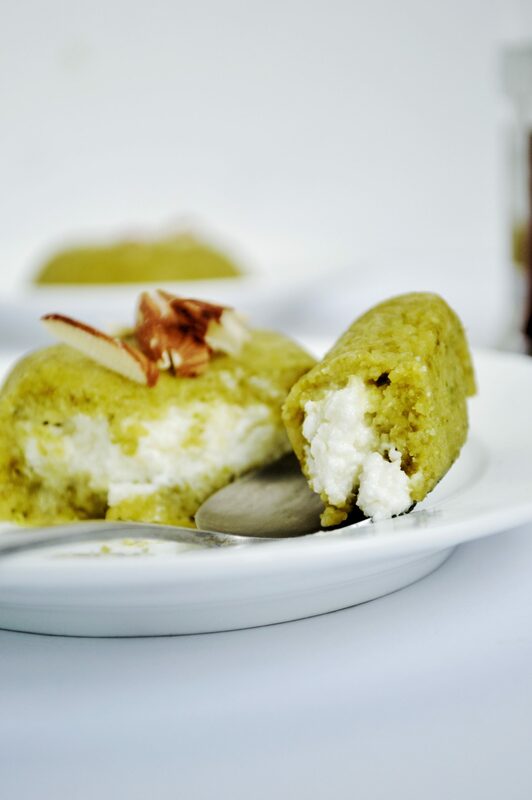 It is filled with mascarpone cheese and sugar syrup is drizzled over it at time of serving. * You can make this in whatever mould you want. It would look really nice if made in tartelet mould. * When shaping the tartlets you can dip your fingers in a mixture of rose water and orange blossom water so that the mixture wont stick to your hand. * The left over semolina dough can be stored in the fridge for several weeks or in the freezer for several months. 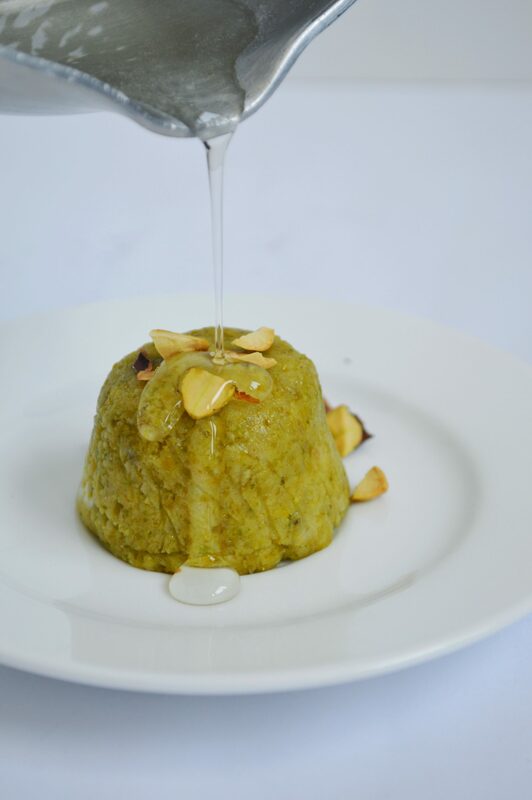 * The semolina i had was not very fine, so i grinded mine in a grinder to a powder consistency. Ooh then u must try making this Habiba! I guess you will like it. I am a big fan of Lebanese desserts too n i loved this. Ramadan Kareem, Sadia 🙂 these are new to me and look amazing! I love the colour, it looks super tasty and a real little treat! Thanks Sonal! Im sure that will be a great alternative for mascarpone. I so love Arabic desserts! It’s easy enough to get good French style pastry in Japan these days but Arabic sweets are nowhere to be found. Oooh you are missing out on some good stuff then. 🙂 i think you should try making this at home if the ingredients are available. It’s possible to get most of the common Arabic dessert ingredients but you don’t have much choice. Just one sort of semolina, two sorts of condensed milk etc. [& yes we’re talking the whole country + online here]. & they are EXPENSIVE. I think I’ll rather gorge on Arabic sweets the next time I’m in Europe! I love your blog and the collection of your recipes beatiful Ma sha Allah! 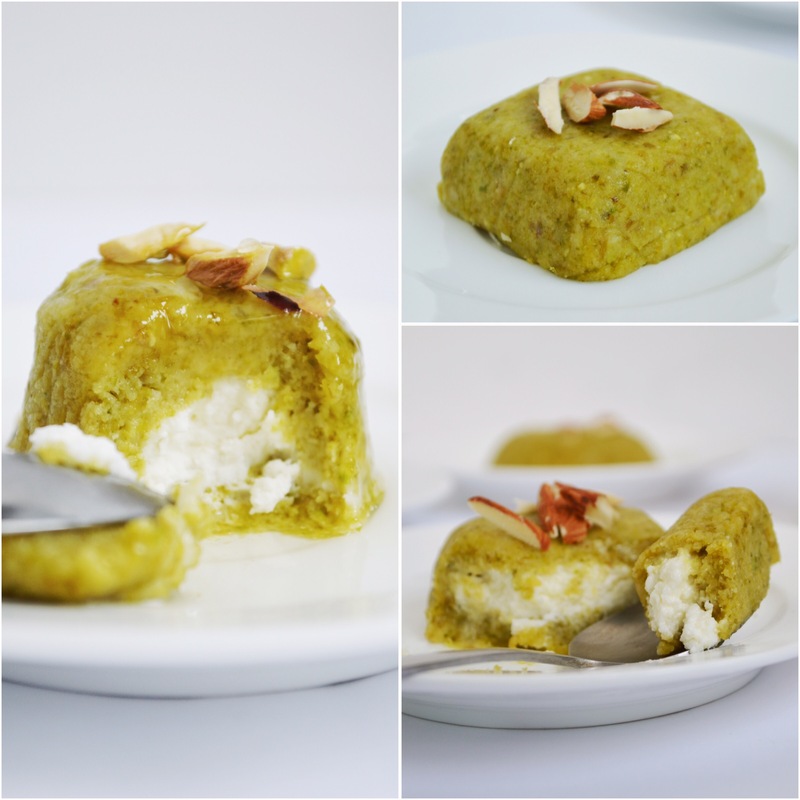 I want to try this dessert it looks delichious (first time I came across the recipe of Mafroukeh)! This dessert looks really delicious! I have a question! If we only need half of the semolina dough, why we dont use half of the ingredient???? Why preserving some dough in freezer?? ?